This week, having discovered a way of getting bright colour, I continued my painting of bamboo. I think it is growing well and now has more depth. I am also becoming very aware of the difference between my two sets of oil pastels, one being rather greasy, giving dull colour and attaching to the surface in patches, and the other more crumbly, giving bright colour and good attachment. As always the quality of the equipment affects the quality of the work. The blue stems are too bright – the intention was to have them fade into the background implying depth! There is light catching the edges of the foremost leaves, though the shapes of those in shadow needs more definition. I haven’t tried using turps yet. I may find the less crumbly set works better that way. Another way forward may be to use the oil pastels in conjunction with acrylic underpainting, using them to add texture and definition after more exuberant brushwork. Might you be able to use the turps to dull the bright blue, without moving the colour around too much? 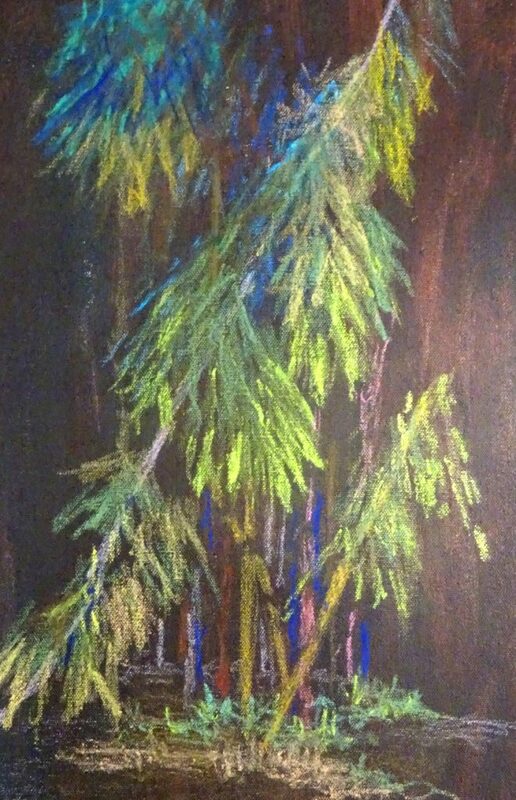 It’s a great adventure, this oil pastel lark, isn’t it! or possibly overlaying a darker colour on it?